Group Exercise Solutions › Add value and increase revenue. Our group exercise solutions add value to member exercise experiences by interactively coaching members during a group training or exercise class. 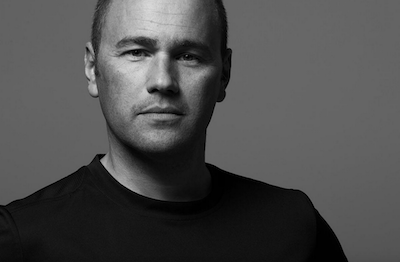 Result – increased revenue! Video Transcript › Our group exercise solutions explained. When we combine two of the most popular Pavigym products, Square 3.0, and Vertical 3.0, the result is more than the sum of the parts. We create Pavigym Combo. The Combo 3.0 enables individuals and small groups to work together and play together to improve speed, strength, balance, and agility. And perhaps uniquely, hand-eye coordination. As with all Pavigym 3.0 products, each station can go into multiple modes, ensuring that you are never going to get bored because there is no repetition. This keeps the members guessing about the type of exercise that comes next. We know that they are getting a tri-planar workout with the added bonus of portion and recoil. But frankly, all they care about is focusing on the random audio, and visual prompts that come from floor and from the wall. Let’s not forget that when we talk about functionality, in just a ten-minute session on the Combo 3.0, we can pump our heart and burn more calories than some gym members have ever dreamt of. All of this is controlled remotely using the amazing Pavigym Synapse app. Now this is available for iPad, and allows you to control all of the features on your Pavigym system. 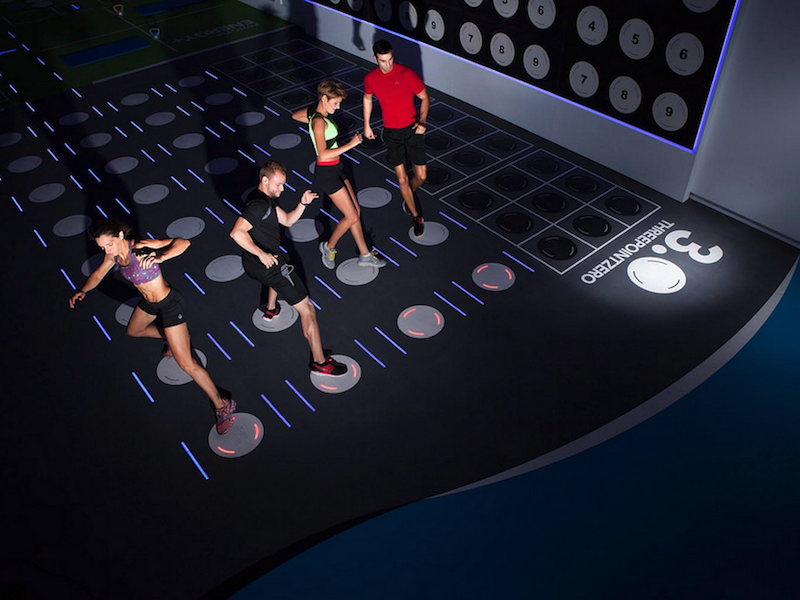 Again, Pavigym combining premium quality products with cutting-edge technology creates you a complete fitness package. What common challenges face health club operators? When we consult for health clubs, it is a common theme that group exercise, and group training solutions lead conversation. What challenges are most common in exercise programming? Perhaps attrition in membership, group training participation, or personal training? Why? Individualized personal training programs help (on a national average) roughly 12% – 15% of your gym members. Meaning that as little as 12 percent of your gym members participate in personal training. What about group exercise? Group exercise is very engaging. The social nature of exercising in a group is very attractive to a higher percentage of health club members. The national average for group exercise participation within a health club or gym is roughly 25% .. a much higher participation percentage over personal training alone. This means that if you employ both personal training and group exercise programs in your gym — you might be helping only 37% of your members. What about the other 63% of your members? This number reflects the highest percentage of members that may leave your club for another solution. What types of group exercise classes attract members? If 63% of your members are not engaged in programs that help them accomplish their goals, many of them will leave. Attrition driven fitness businesses trade members. Boutique fitness studios are growing faster than ever. Why? Perhaps because they are focusing purely services. Their focus on non-dues business over membership dues illustrates a commitment to providing solutions. If you’re reading this — it’s entirely likely that you, too, focus on your members with authentic concern for their needs, and solutions. If you want to attract, and help the greatest percentage of your health club members become healthier, stronger, and maintain their ideal fitness level — you’ve got to create innovative ways to encourage more members to try new exercise experiences. While personal training is an intimate form of exercise instruction, limitations related to pricing and scheduling can create barriers to entry for many members, about 85% of your total number members are not going to participate in traditional personal training! Group exercise, like aerobics, group cycling, functional training camps, boot camps, pilates, yoga, and other class based exercise experiences create greater opportunities for participation. Still, about 75% of your members will not take part in traditional group fitness programs. High value health clubs, fitness facilities, and gyms, included these classes with membership driving more value in the membership proposition. 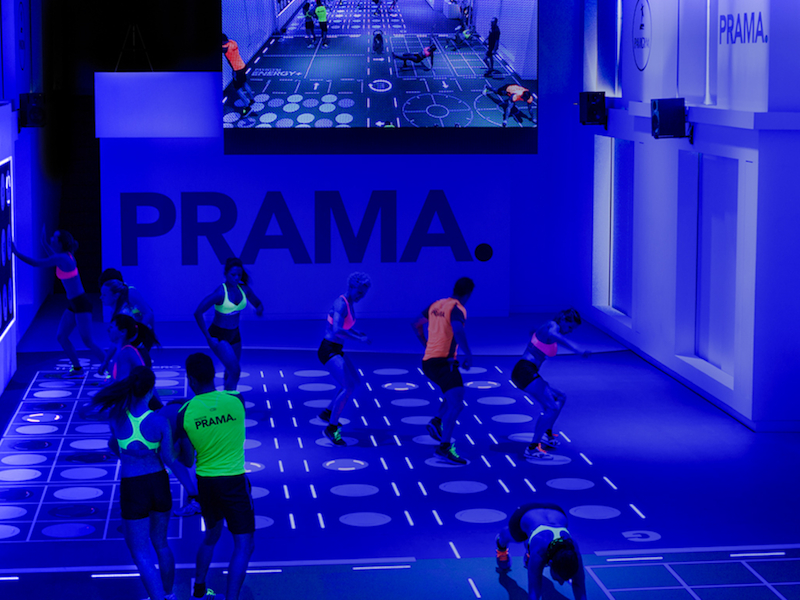 Clubs that offer group fitness, and group exercise classes can justify higher membership rates because these services add a lot of value to the membership and communicate the value of your brand. So, what must you do to create more love for group exercise? *Hint — create more value. How to increase membership and exercise program revenue? More to the point made above, if you create even more value in exercise programming it is even easier to justify additional exercise services, premium memberships, and value based programs for members. Outside of the included standard membership benefits, members can elect to take advantage of premium programming to better focus on their needs, expectations, and exercise experiences. Members love to get what they’re paying for, when given a decision to pay for more, for more, this is the essence of value. People expect to get more — so give it to them. Price is only an issue in the absence of value, you know this. Adding a special functional training program, a premium group exercise, and group training solution allows both you and the member to win. Your member loyalty improves, attrition drops, your revenue increases, your members enjoy their new experiences, your group exercise instructors love teaching new programs, they do a better job for you, members refer their friends, family, and coworkers — you get it. Everyone wins! Why are people confused by traditional group exercise? We think this way of thinking — interactive group exercise, is a smarter way to reach more people and provide experiences that appeal to your members. However, if you think the way your health club member thinks, you might see your traditional group exercise classes a bit differently. Think about the way a member might look at a traditional functional training class. It is our experience that when surveying health club and gym members about their exercise habits, and specifically why they either do or do not participate in group exercise — the most revealing, and common answer is related to confusion. Gym members simply are confused by some group exercise class formats. 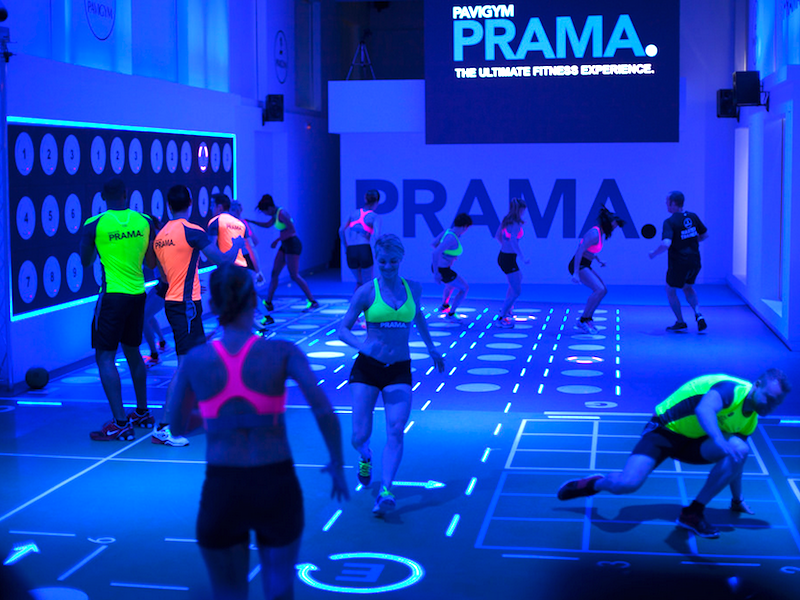 Functional training could look like a bunch of aliens running around to your members! The perception of the format is unclear — because it is undefined. Add to the confusion, they report that they have tried several different small group training, and large group exercise classes, but feel the classes offer little change, and worse, many gym members feel uninspired to continue taking the class. Why? Well, it’s very simple actually. Think of walking into a class wherein there are roughly 30 people. Imagine a typical fitness class. Now, what do you see? Do you see a large group of people struggling to interact with the instructor? Do you see people running around, throwing balls, maybe swinging kettlebells, or using equipment, and accessories, that are completely foreign to most people? What is the interaction between the instructor and the class participants? One fitness instructor can only respond or encourage one, or two people at a time. The interaction is limited between one instructor and many people. This make it very easy for the health club member to become confused, frustrated, and less likely to continue taking the class. Think about it — we know you’ve seen this over and over. This is why attrition rates are out of control for many small group training classes, and some large group exercise classes. Simple, it’s confusion, lack of interaction between instructor and member, and frustration. The solution is to define the experience so that a guest or member can easily understand, and interact with guided exercise. How does our group exercise solution change this equation? Rather than have one instructor lead a large group fitness or small group training class, we think the gym member should feel like they have immediate and personal interaction to encourage their movements, and inspire them to participate in group exercise more frequently. How do we do this? Well, since only one instructor typically teaches or coaches a group exercise session — technology must step in to replace additional instructors. This is exactly what makes each of our exercise solutions very valuable. The interactive nature of our group exercise solutions, as demonstrated in the video above, literally multiples the coaching, cuing, and prompting efforts of a group exercise instructor directly with each of the participating members. Now imagine how your gym members would view, and think about group exercise .. are you seeing a different picture now? 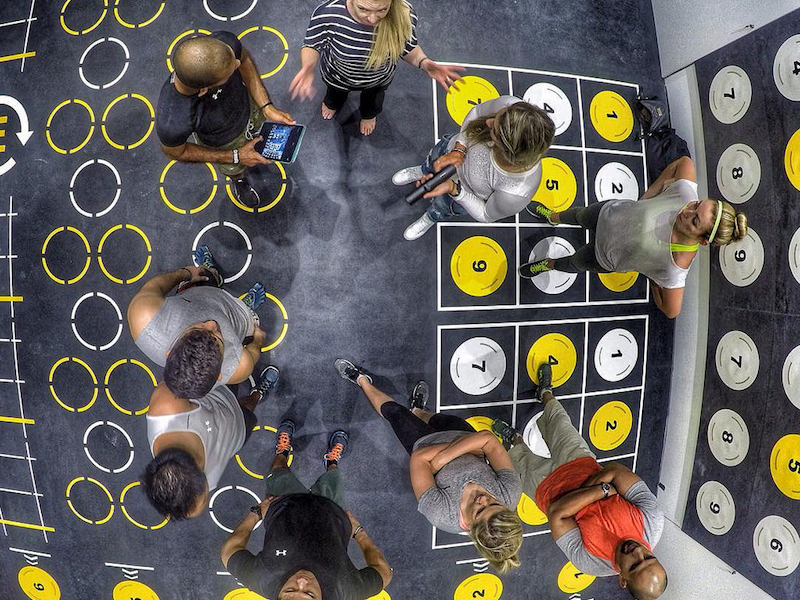 As demonstrated in the video, one instructor coaches many members using a combination of our interactive fitness software, a hardware device (iPad for example), our technical flooring platform, and technical vertical exercise platform. The combination of these technology based group exercise solutions deliver guided, interactive, and engaging exercise experiences. 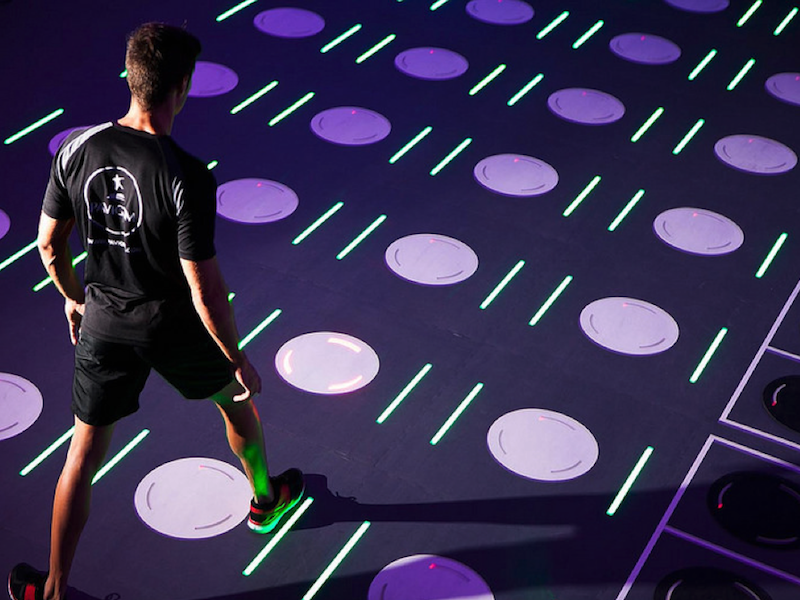 The LED lighting, mood lighting, embedded sensors, and mapped out squares, dots, and other exercise markings embedded in the flooring and walls direct members to perform exercises exactly as prompted. How to increase group training membership? When it comes down to it — you can either improve the exercise experience you deliver to your members or your competitors will. Your revenue can flatline, and your membership attrition rates can increase if you do not adjust to technological advances in exercise programming. What makes our solutions unique and deliver higher value experiences to your members is the fact that we are the original manufacturer and supplier of this type of technology. We literally invented this concept! If you commit to using a portion of your club to engage members, guests, and group exercise instructors, you will see an incredible increase in both personal training revenue, and group training or group exercise revenue. Why? Because people participating in group training have never seen anything like this — and it works! Imagine your employees, sales staff, and support staff touring a prospective member throughout your facility reinforcing your value proposition by explaining, and demonstrating how our group exercise solutions specifically address prospective client and member needs and interests. Imagine personal training program penetration raising from 12% to 20%, and group exercise participation raising from 25% to +30% .. are you adding up the numbers? Few people can make these claims, we can. We do. Need to learn more about our group exercise solutions? Do you operate a health club, gym, or fitness facility? We welcome you to speak with a us today about your brand, services, and exercise programs. We can show you how our group exercise solutions can help you increase your membership value and increase both dues and non-dues revenue. After you contact us – don’t forget, we can support your facility, personal training, and group exercise programs. Yes, it’s free – always. Simply click on the blue triangle, above to the right, to register the exercise professionals responsible for working with your members and guests.